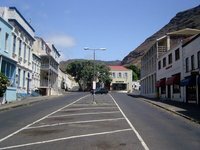 Jamestown is the capital of Saint Helena and has a population of roughly 1000. It is a harbour and was founded in 1659 by the East India Company. The town has some great buildings, in British Georgian era colonial architecture. Many other buildings are built out of locals materials such as volcanic rocks. The town is the administrative, cultural and commercial centre and functions as a port as well. Jamestown is also the main transportation hub of the island and is located between some large steep cliffs. The town is not able to grow any further as it is already densely populated even though the population has declined during recent years. Strangely enough, because of its location at sea level and between the cliffs, the temperatures are notably higher than elsewhere on the island. Plantation House (built 1792) is the home of the Island's governor. The building looks like a georgian mansion plucked right out of England and plopped down in the South Seas. The grounds are lovely, and there is a nature trail through the park. A number of Seychelles tortoises inhabit the lawn, and one, Jonathan, is said to be the oldest known vertebrate on earth! Jonathan is joined by David, Emma, Fredricka and Myrtle. Saint Paul's Cathedral (built 1856), the most significant religious building on the island and the seat of the Anglican bishop of Saint Helena. The Castle was built by the British in 1659 shortly after they took over the island. It serves as the seat of government, and even if you are not on a tour, you can probably peek into the Council Chambers. The Archives and Administration of the island are also located in the Castle. Very near by is the Courthouse, which his a lovely building in itself and well worth a look. It houses the Magistrates and Supreme Courts. The Museum of Saint Helena is a great place to start your visit, though like most other attractions the hours are very limited. The museum is located in an early 19th-century warehouse at the foot of Jacob's Ladder in Jamestown. Ithas a variety of exhibits on the island's history and natural history. It was established in 2002, so the information is up to date and the installations are beautiful. The Cenotaph on the wharf in Jamestown includes the names of all Saints who died in the two world wars, including those who perished in a German U-boat attack in James Harbour in 1941. Jacob's Ladder is the somewhat misnamed staircase that rises from Jamestown to Ladder Hill Fort high above. It is said to have 699 steps. The "Ladder" was built in 1829 as an inclined plane to help Jamestown haul ammunition up to the post on Ladder Hill. Then it was used to bring goods down from the farming areas in the centre of the island, and manure up out of town. The planes are on either side of the steps, and the cart on one side was used to counterweight the cart on the other. The Ladder is a prodigious climb at over 900 ft (270 m) long, with a vertical drop of about 180 metres and with a slope in places of about 45 degrees and very few tourists can climb it in one go. In addition to its length, its stairs are somewhat high, making the climb all the more difficult. There are railings, but no landings for the entire length, and those who are afraid of heights may not want to look down. If you see a kid around, you might want to ask them to show you how to slide down the railings; they are reputed to have invented a way to do this scary feat without killing themselves. The Ladder is lit at night. The Post Office is in a rather disappointing building, that looks as though it could be much more interesting with a little help. It was apparently once an Officer's Mess. This is the place where you can buy one of Saint Helena's most famous exports: postage stamps. The Post Office sends out the stamps of Saint Helena, Ascension and Tristan da Cunha to philatelists all over the world. The Castle Gardens is an oddly shaped park behind the Castle. In addition to a wide variety of relatively pedestrian tropical plants, tourists can also see some of the island's endemics here. It is also a good place to see swarms of the songbirds that have been introduced to the island over the years hanging around in the huge ficus trees. Fortifications were built across the mouth of the James Valley where it meets the sea only after Napoleon was brought to the island in the 19th century. Apparently there was no entrance originally, but a lovely archway has since been built that frames the harbour in one direction and Jamestown in the other. Heading into Jamestown the coat of arms of the English East India Company can be seen above the archway. Upon exiting, you can see a plaque depicting the island's endemic Wirebird. Heart-Shaped Waterfall. You might be excused for thinking that the water itself falls in the shape of a heart, but really this waterfall is so named because of the heart-shaped rock over which it falls. It can be seen from the north road out of Jamestown or walk to the foot of the 90-m fall, simply follow the valley up from Jamestown. Details at the St Helena National Trust. Saint James Church, is a rather dark church just inside the fortifications of Jamestown and across from the Castle. It is the oldest Anglican Church in the southern hemisphere, dating from 1774. Mundens Battery - Overlooking James Bay and built on the opposite side of the valley to Ladder Hill Fort, Mundens was built to aid the defence of James Bay. Mundens Battery can be explored after a short walk along a slender walled path, several building to Explore including gun Victorian Gun emplacements, Magazine. A Rickety ladder leads to a lower gun emplacement, on the rocks directly below the Battery can be seen Several of the Guns from the Mundens Battery. The Saint Helena Airport (HLE IATA) opened for regular traffic in October 2017. The South African carrier Airlink operates weekly flights to St. Helena from Johannesburg via Windhoek and there's also an onward flight to Ascension Island once a month. In addition charter, taxi and ambulance planes operate there. ExecuJet, a charter and fixed base operator in Cape Town, is among the companies most experienced at flying to St Helena, weather permitting. A freight ship, MV Helena transports goods to and from St Helena and has a few cabins for passengers. RMS St Helena, one of the last Royal Mail Ships, used to be the only way to get to and from the island. As St Helena became accessible by regular flights, the ship was removed from service on Wednesday 24 January 2018 and sold. Moorings for yachts are available at James Bay. Contact the Harbourmaster (VHF channel 14, during working hours) to obtain access to the visitors' moorings; call St Helena Radio (VHF channel 16) to conﬁrm your arrival and seek customs/immigration clearance. There are also a limited number of cruise ships who call at Saint Helena a year, and who will very occasionally consent to leave passengers on Saint Helena, or to take them off (though this later course is almost always for medical reasons only). It should be noted that if the weather is not conducive, passengers are not be allowed to get off the cruise ships for safety reasons. An average of 150 private yachts also call at Saint Helena annually. The town itself is small and easily navigated on foot. It is very hard to walk out of Jamestown though. The city is in a deep canyon coming from the highlands down to the shore, and there are three roads out, one up either edge of the canyon and the third, Barnes Road, an old track that leads to Francis Plain, perched on a plateau 500 metres above Jamestown. The other way to get to the highlands is via the vertiginous Jacob's Ladder, an extremely tall 699-step staircase, built as an inclined plane to bring goods in and out of town. Walking on the roads out of town would mean sharing narrow switchbacks with cars, lots of dust, and no pavements. If you walk, even once you climb Jacob's Ladder, you still aren't halfway to the green spaces at the top, and have to walk through the beautifully named, but not so beautiful to look at, Half-Tree Hollow. A rental car or the bus are much better options. The two main hotels in Jamestown, The Consulate and Wellington House both offer dinner if booked a day ahead, and they will also ask you to choose what you wish to eat when you book. The Consulate also offer lunch time braai's with a changing menu. Anne's Place in the Castle Gardens have a changing menu depending on availability, but offer large portions of seafood, steaks, and other local specialities, as well as all day breakfasts. It's the largest restaurant on the Island and is popular with visiting yacht crews. The Orange Tree Oriental restaurant offers decent Chinese and Asian dishes, though it is the most expensive place in Jamestown. Book ahead, in case they are full (weekends) or closed (weekdays). The Coffee Shop offers breakfasts, toasted sandwiches and wraps, as well as being a good place to try Saint Helenian coffee. Cyril's fast food (in a window by the arch) is a basic takeaway open some lunchtimes and evenings only. In addition, there is a burger van and an ice cream van outside the Castle, whilst Spar supermarket offer pies and pasties plus a daily takeaway lunchtime special. Huxtable Accommodation, Napoleon Street, Jamestown, ☎ +290 24342, e-mail: info@sthelenahuxtable.com - Four independent flats in the centre of Jamestown. Details, prices and full contact information on the website. Consulate Hotel, Main Street, Jamestown, ☎ +290 2962, e-mail: con.hotel@cwimail.sh - The Consulate Hotel is the largest lodging facility on the island. It has a restaurant and bar, and all bedrooms are en suite. The front porch under the wrought-iron balcony is a fine place to sit with a Savanna cider in hand and watch the world pass by in central Jamestown. Wellington House Hotel, Main Street, Jamestown - The Wellington House Hotel is in a beautiful, cobalt blue Georgian building located on the main street in Jamestown. Rooms are comfortable, boarding options are available, and a bar can sell alcohol to guests. Bathrooms are not en suite. Internet access came to Saint Helena ten years ago, and Broadband was rolled out in 2008. However, due to the logistical issues, it is still reasonably slow and quite expensive, and the entire bandwidth of the Island is less than some European providers offer to individuals. The Consulate and Wellington hotels offer wireless internet access for guests only, and there are public access wireless points in Anne's place and in the Market (buy credit through Ardee's cafe) which cost £6 an hour. There are two coin operated Internet machines at Anne's place. A third hotspot at the harbour (based around either the St. Helena yacht club or Donny's/Bayside, or potentially, both) is due to be launched in 2009. Island post is quite rare due to it's physical size, and the fact that everybody knows everybody else and thus delivers items like Birthday cards by hand. The only exceptions are bills and government correspondence, which are collected from the front desk in the main post office (ask to check your local mail) or sub post offices if they remain uncollected. There are no door to door postal deliveries, but if after a week or two you haven't collected mail, it is not unusual for you to be phoned up or stopped on the street in Jamestown to be told there is mail awaiting your collection. The main Post Office in Jamestown will hold items marked 'Poste Restante' for 3 months, or longer if they are pre-warned or know the person it is addressed to. There are no parcel or courier firms on the island, but the Post Office can arrange to send registered post. Note that Saint Helena now has it's own post/zip code of STHL 1ZZ: This was brought in to (a) allow people to shop online and order goods mail order, but more importantly (b) to try and solve a long term problem whereby post marked Saint Helena often ended up in Saint Helens (a town near Liverpool in the North of England) or Saint Helier (the capital of Jersey in the Channel Islands). Saint Helena produces its own stamps, which are well regarded and first day covers in particular are well sort after in Philatelic circles, and the sale of them is a small but significant contributor to the Islands economy. This is version 13. Last edited at 10:39 on Sep 28, 18 by Utrecht. 4 articles link to this page.